This is the story of Allie and her kittens. Allie arrives heavily pregnant. She is two years old and, at her age, this is unlikely to be her first litter. She is signed in and makes her way to our cat care room with the maternity team so that she can have her initial health check, be weighed, deflead, wormed and tested for ringworm. Once this health check has been completed she is taken to her pen in the maternity wing and settled in with a special birthing box and some food and water. Allie is checked daily. Her pen is cleaned out and she is under close monitoring watch for the imminent arrival of her kittens. No signs of arrival just yet. 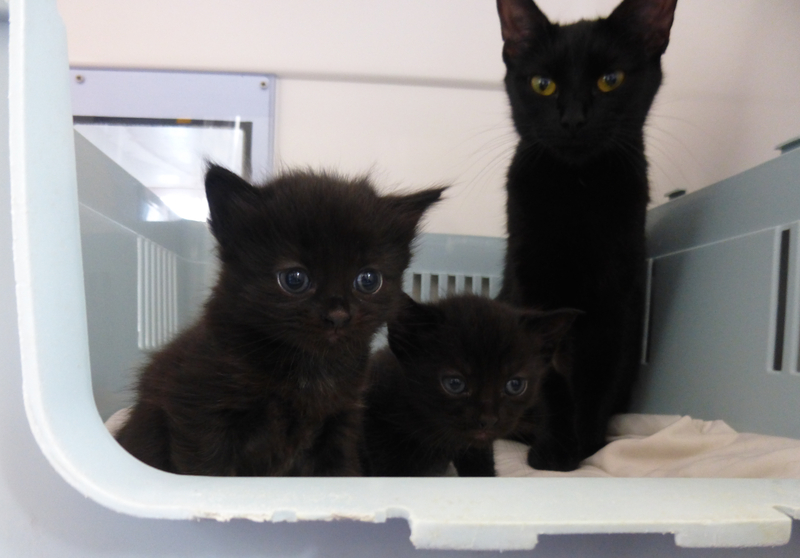 Every morning, the maternity team check all the kittens and mums that they are all well. Arriving at Allie's pen this morning, they notice that she has given birth to four kittens overnight. They all appear well and mum is doing a great job. After a full examination, we see that she has had two boys and two girls. They are given names: Arthur and Apple are the boys, Angel and Alice are the girls. They are all black, just like mum. Please find pictures attached of them at three days old and with mum. The umbilical cord should dry out quickly after the birth and should naturally fall off at this stage. The average birth weight is 90-110g, dependant on breed and number of kittens in the litter. Kittens should gain 50–100g a week and should double their birth rate by two weeks of age. Here they are at one week old. Crawling starts at seven–14 days. Kittens still will be stimulated at the rear end by their mum to pass urine and faeces and this will continue until they are three weeks old. At this point should be able to go by theirselves and should have mastered their litter tray. Sad news today. Despite our best efforts, Alice, one of the kittens, did not survive the night. She was found in her bed with mum. A very sad day for the team but one that we have to cope with and move on. On a positive note, all the others are doing well and flourishing. The kittens are three weeks old and are walking. This is the socialization period, considered to be the sensitive period of a kittens learning through to eight weeks. This is when kittens will learn what is normal and safe. Having a variety of positive experiences during this time period for example different sights,sounds,textures and smells,will mean they are more likely to be able to adapt in the future. With this in mind the team start to play sounds through a player of all the normal sounds in a home environment,such as A washing machine, TV, telephone, hoover, doorbell, children playing and screaming, laughter, loud voices, fireworks etc. The kittens are five weeks old. They are now starting to wander around a bit more and are venturing out of their birthing box under the watchful eye of their mum. It is at this stage that the team looking after them in the maternity wing will start to introduce the idea of kitten food to them. They will slowly wean them from their mum, whilst monitoring closely to ensure they are all feeding effectively and gaining some independence. At the five-six week point we will remove the ladder to the top of the pen so that mum can start the weaning process, too, as she would in the wild. This will also give her the opportunity to get away from the kittens for a period of time as they will not have the ability to follow her. At seven weeks old, the kittens will now start to spend short periods of time away from their mum in preparation for being permanently split at eight-nine weeks of age. They are getting bigger by the day. Angel weighs 0.77kg, Apple is 0.78kg and Arthur is 0.83kg. They have started their flea and worm treatment and in the next week or so will be microchipped, will start their vaccination course and be neutered. Now nine weeks old, Angel, Apple and Arthur are doing very well. At eight weeks old they received the first part of their vaccination course and the final part will be given when they are aged 11 weeks. They have all been neutered, microchipped, flead and wormed and have been declared by our vet to be fit to home, so they will be moving to our homing wings very shortly. Good news! Arthur went to his new home 21/9, Angel went to her new home 23/9, and Apple went to her new home 26/9.